﻿ CampusTales - Best University? I might or might not have mentioned this in blog posts before, but I’ve experienced four universities for my undergrad. After I graduated from high school, I spent a semester at Keio University in Tokyo. In August of the same year, I moved to the States to start my undergrad degree at Georgetown, and studied abroad in two different locations during my junior year: Chinese University of Hong Kong (CUHK) in fall semester and University College London (UCL) in spring. Because my previous blog posts have been a bit academic heavy, I would try to make this post something fun by comparing these four universities. I will evaluate each university based on the criteria: academic, student activities, food and campus. This evaluation is solely based on my experience. Please acknowledge that some comments are super biased. Georgetown: ★★★ We do study a lot, read a lot and write many essays. Exams never end. However, academic supports are well constructed; it’s easy to talk to professors and you can always ask teaching assistants for help. Keio: ★☆☆ You don’t have to study/come to class during semester. Just pass the finals with C. No one cares GPA. It never hurts your resume. CUHK: ★★☆ You’ll be disappointed when you realize a class you want to take is only offered in Chinese. UCL: ★★★ Need to be highly motivated to study in order to survive under this UK education model, “independent study.” Attendance not required, assignments not counted towards your grades and no midterms. Since UK education is 3 years and focused on your major, academic level is really high. Georgetown: ★★☆ Many students are actively involved in student organizations. Some of them are really competitive to get in. Keio: ★★★ Club activity is 99% of most Japanese students’ college life. CUHK: ★★☆ I often saw performances or some groups having events on campus. UCL: ★★★ I think it has the largest variety of organizations, and most of them are open to people who don’t have any related experience. Georgetown: ★☆☆ Campus dining is… not good not bad. Keio: ★★★ Food is cheap and awesome. CUHK: ★★★ There are 20 canteens on campus. Food is cheap and good, but you may get something different from what you wanted to eat because their English menu sometimes doesn’t accurately describe what the meals are. Georgetown: ★★☆ Georgetown campus and neighborhood is pretty except for the library building that breaks the aesthetic consistency of the other buildings. CUHK: ★☆☆ The campus is the mountains. If you love hiking, this is the best place for workout. If not, use the shuttle buses running around the campus. 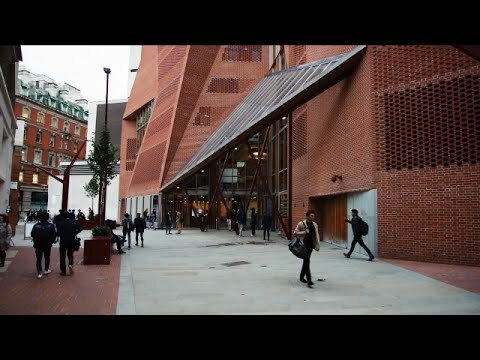 UCL: ★☆☆ Because the school is located in the very center of London, the campus is small and I felt like its campus plan is inconvenient to walk through especially when I was running from one class to another in a different building.